Depending on the species, pupae of ants can be of 2 types: some naked, others placed in a silk cocoon that the larvae produced before moult. Pour le reste, les nymphes sous cocons sont similaires aux nymphes nues. 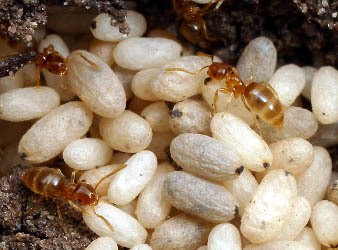 The nymphs wrapped in their silken cocoons are often used as "ant eggs" to feed fish or birds.